Whether you're a point counting health nut or a pastry gobbling hedonist, you'll likely find what you're looking for at Queen of Tarts Bakery and Cafe, located on the lower level of the Salem Public Library. A recent lunch outing with the kids had the angel on my shoulder wrestling with all his might against the devil sitting opposite. All regular menu items are marked with Weight Watchers point values, a stark reminder that what you eat has a direct effect on your waistline. But while making your order at the counter, you face a display case filled with decadent pastries, cakes and cookies the likes of which could tempt even the strongest wills. I compromised by ordering the cobb salad, a mountain of fresh veggies loaded with bacon, chopped chicken, eggs, avocados and blue cheese crumbles. My friend Adam ordered the Greek roast beef sandwich and the kids ordered two wiener wraps and grilled cheese, the only dishes offered on the children's menu. Aside from the limited children's menu, Queen of Tarts gets an A in kid-friendliness. Kids menu items come with your choice of fresh fruit or chips, and the sweet lady behind the counter had the grace to mention this quietly, so I could opt for fruit without setting off a rally for chips among the little ones. When water was brought to the table, my four year old was given a plastic cup and straw rather than a large glass, and all the kids were given a choice of 100% juice pouches brought with their meals. The cafe had run out of fruit salad, but the chef offered to make up a new batch if the kids preferred salad over the bowls full of grapes that came with their meals. Adam's sandwich was hot and generously filled with delicious roast beef, fresh veggies and feta cheese. 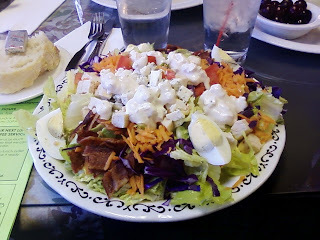 My salad was enormous, and I ended up taking more than half of it home. The bacon and chicken were both very good quality and the salad was heaped with a liberal handful of blue cheese crumbles. However, the star of the meal was the wedge of bread served as a side to my meal. All eyes were on it from the moment our lunch was served, and I ended up splitting it five ways so everyone could have a taste. We weren't disappointed. The crust was crispy and the crumb was chewy and tender. I also highly recommend the coffee and espresso, roasted by Cape Foulweather Coffee Company, based in Lincoln City. 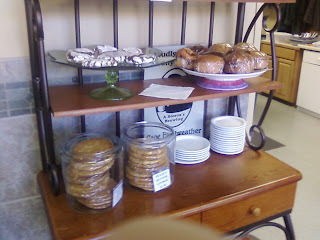 Check the Queen of Tarts blog for a coupon for weekday free house coffee with purchase of baked good. The large portions left me with no hope of saving room for dessert, but thankfully, kids always have space for sweets, so we grabbed a few giant cookies to go. Next time I'll get the half order of salad, or forgo the healthy stuff altogether and opt for coffee and a pastry or two! This a great place, but I wish they had more vegetarian options. Cascade Baking Co. also has great sandwiches and have at least a couple of vegetarian options. I love this café. It’s the best kept secret in Salem. They started listing the Weight Watchers points on their menu a few years ago when a lot of their neighboring City Hall customers joined Weight Watchers. They have weekly WW meetings for City Hall employees in one of the meeting rooms just off the café and the WW members love grabbing a lunch to go to their meeting (myself included). They also love being able to count their points on other days when they come in for lunch. Hmmmm….I wonder how many points one of their delicious pastries are? The picture in this post doesn’t do the pastry offerings justice. They have another large case (not pictured) filled with all kinds of house baked goods. I’ve never eaten a sandwich at Cascade Baking Co., but ironically QT uses Cascade Baking Co. rolls for their sandwiches. Besides all the house made delectable pastries to choose from what I think sets this café apart from the rest is the passion & pride the owner/baker has for good quality ingredients in everything she makes. All of the sandwich meats are marinated, roasted and sliced by the café. All of the salad dressings are made from scratch. The soup is made from scratch daily and the list goes on. 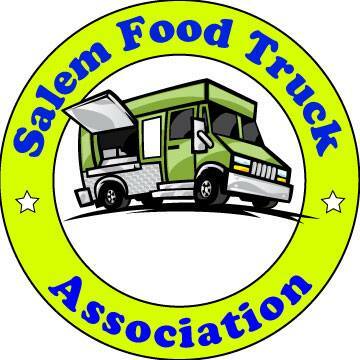 They also have a booth at the Salem Saturday Market selling lunch items and LOTS of fresh baked goods. Get there 1st thing in the a.m. and try a warm just out of the oven caramel pecan roll, cinnamon roll or orange roll. UGH…there goes my diet. Was it cloudy? I saw (some) sun today. :) This link on ES shows the other cases. One of the ABSOLUTE BEST places in Salem to eat! The diverse menu of creative sandwiches, soups & salads always taste remarkably fresh,are bountiful and positively delicious! Add to that the amazing desserts made by the 'Queen", herself and the attentive service from her staff, well, heck, what else is there to say? Definitely at the top of my list as one of the few, "must go to", restaurants in town! As for vegetarian options,my frequent lunch date just asks & they always accommodate! Nothing but love for this cafe --Long live the Queen of Tarts! It’s truly difficult to over-rate a place that’s this good! It’s also interesting that its exposure to the public is almost entirely through word-of-mouth by discerning patrons mentioning it to others who they know would also enjoy this wonderful place. You’ll see no billboards or glitzy signage here. At Q of H, one has the feeling of sharing a secret with like-minded folks who enjoy the small, but special, pleasures of life. Q of H has Soups, Sandwiches and Salads; all of which are made with the highest quality and freshest ingredients available. But their uniquely stand-out offerings are their baked goods. Torn between adherence to decorum and the inevitable contrasts which must naturally be drawn between Q of H’s baked delights and the much-over-rated/priced retailer (much, if not most, of who’s baked goods are purchased elsewhere) a few blocks south, I’ll not disparage the latter. Oops! Too late! For a top notch lunch, or a sweet treat with someone special (Or hey. Go for it. Why not both? ), it’s hard to see how Q of H can be beat. Note: I have it on the very best authority, that Q of H now has a knock-out Reuben Sandwich on their menu. Having been on a life-long quest to find the world’s best Reuben, you know I’ll be checking theirs out soon! Could it be my search is almost over? Stay tuned more to come.